How can I exchange my PURA into cash? A Pura supporting company launched a Debit Card in January 2018, where it’s possible to load the debit card with PURA. As their policy is to prevent any public marketing for security reasons, we cannot publish any link or source. Please ask in our community channels for information. Another way is to change Pura to other Coins like BTC on one of the exchanges, where Pura is listed and sell this coins on common known Fiat/Crypto Exchanges. How do I purchase PURA on coinexchange.io? How do I purchase PURA? With the update to Pura Aurora, Pura introduced the “push to deploy”-masternode-function. As with all other masternode-coins you do NOT need to setup a server or basic programming skills. Just download Pura Aurora wallet, transfer 100.000 Pura to your wallet, push the masternode button, wait until the masternode is deployed and start your passive income! What are the technological requirements for setting up a masternode? You need 100.000 PURA, the Pura Aurora Wallet and your finger to push the “push to deploy”-button. As easy as that! To start mining you require a miner client (GPU) or X11 hardware. You also need a PURA wallet address. PURA Dawn was the update of the original PURA coin. We added Difficulty Adjust (DELTA DIF) to the coin and adapted the first functions for mass market adoption. Please refer to (http://mypura.io/dawn/) for further information. Pura is a decentralized cryptocurrency designed for fast and secure payments with an additional built in benefit for the common good. Where do I set up a PURA wallet? I missed the date of the PURA coin swap – what should I do? Some days after the coin swap all not swapped coins were burned transparent. We are very sorry that we cannot offer any further exchange. I would like to take part in the bounty – can you provide me with information? At the moment the Pura Bounty Programme did not start. We will inform all “bounty hunters” in our official channels when the programme will start. My wallet does not synchronize with my network. What should I do? The wallet requires enabling of certain ports in your computer settings in order to communicate to the outside. If these ports are disabled by your internal firewall, synchronization may no longer be possible and as a result you are not able to view your latest transactions. Please consult your local network technician to resolve this issue. On which mining algorithm is PURA based? PURA is based on the algorithm X11. Please refer to the PURA whitepaper for further information. What is the difference between PURA and Puravidacoin? Puravidacoin was the first draft of a new generation of payment coin. PURA is a totally new created blockchain and has nothing to do with Puravidacoin anymore. What types of PURA desktop wallets do you offer? More wallets will be added over the next months. The PURA Dawn update of the original PURA coin in September 2017 introduced fair mining, to empower individual miners to receive a fairer share of the mining rewards by enabling them to better compete with large mining pools without needing to invest large sums of money in specialized mining equipment. When I start my wallet for windows, I get an error message stating that all uncrypted data is deleted – why? This is a warning that we recommend to secure your wallet with a password. Additionally you should save your private key separately to prevent yourself from loss of funds. When will you offer PURA wallets for IOS and Android? Development is nearly finished and the mobile wallets together with mobile mining feature will be released shortly. Where can I find the private key in my windows-wallet? Which percentage is the Masternode-Reward? The Masternode-Reward is not a fixed rate. On every mined block one masternode sequentially gets after the Pura Aurora Consensus Update 5.16 Pura reward with appx. 1.150 blocks a day. Depending on the total number of masternodes deployed and active, the reaward should be roughly 5 Pura a day. Why can’t I see the team behind PURA? Privacy is a valued asset in the world of cryptocurrencies. The majority of the team prefers to remain anonymous. PURA is a global cryptocurrency with a strong and active community and a professional international team that brings a wealth of experience in the fintech industry and blockchain technology from its early beginnings. The mission of the PURA team is based on sustainable coin development, in-depth education and information on cryptocurrencies and blockchain development, social and environmental protection and promotion of mass adoption. Why does the PURA website on WordPress – it seems unprofessional! PURA is a community-driven and decentralized cryptocurrency for the common good. For this reason, PURA uses WordPress, the world’s largest open source web-design platform, on the website. WordPress is easy to use and allows all members of our team, including those without expert knowledge in programming, to be actively engaged in the communication process and make adaptions on short notice as required. PURA supports open source and community-driven platforms such as WordPress in line with efficient, effective communication, sustainable utilization of all resources as well as publication of valuable content. These elements are in line with the PURA vision of decentralization and environmental and social development around the globe. Why have I not been able to mine more coins? The minins results of your miners depend on different variables, such as network hashpower, your mining pool etc. PURA is not able to predict on results or take influence on the results. Why is the PURA Team not around 24/7 in all time zones to answer to requests and complaints? This is not like other coins. No, it is not. Like in real life, support is not available worldwide 24/7. Some team members may be out eating, sleeping or taking a shower. However, there are several PURA community channels (Telegram, Discord, Instagram etc.) that are very active, operated by the community and community members around the globe are always glad to answer any questions. 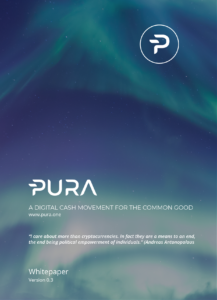 Official PURA announcements are made in the blogchain, on PURA Facebook (Link: https://www.facebook.com/officialpura/) and PURA Twitter (Link: https://twitter.com/purasocial) as soon as they are released.